On a spring morning in 1951, eleven-year-old chemist and aspiring detective Flavia de Luce gathers with her family at the railway station, awaiting the return of her long-lost mother, Harriet. Yet upon the train's arrival in the English village of Bishop's Lacey, Flavia is approached by a tall stranger who whispers a cryptic message into her ear. Moments later, he is dead, On a spring morning in 1951, eleven-year-old chemist and aspiring detective Flavia de Luce gathers with her family at the railway station, awaiting the return of her long-lost mother, Harriet. Yet upon the train's arrival in the English village of Bishop's Lacey, Flavia is approached by a tall stranger who whispers a cryptic message into her ear. Moments later, he is dead, mysteriously pushed under the train by someone in the crowd... Who was this man, what did his words mean, and why were they intended for Flavia? 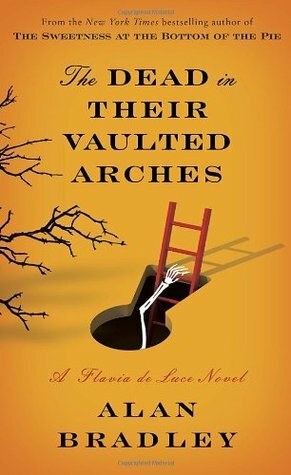 Back home at Buckshaw, the de Luces' crumbling estate, Flavia puts her sleuthing skills to the test. Following a trail of clues sparked by the discovery of a reel of film stashed away in the attic, she unravels the deepest secrets of the de Luce clan, involving none other than Winston Churchill himself. Surrounded by family, friends, and a famous pathologist from the Home Office - and making spectacular use of Harriet's beloved Gypsy Moth plane, Blithe Spirit - Flavia will do anything, even take to the skies, to land a killer.